Making outlet holes and cuts on drywall require some skills and the right cutting tool. The same case applies when cutting drywall panels during a home building or renovation exercise. You can click on the red link to go directly to the tool reviews or quickly choose the preferred tool with the following summary table. The simplest and easiest way to cut drywall during a home remodeling task is with the use of a drywall cutting utility knife. Compared to other drywall cutting tools, drywall cutting knives are cheap for anyone looking to cut a few sections or pieces of drywall on a budget. There are a number of various knives that have been specifically designed for cutting drywall. Each of these knives has their own merits and demerits. The Drywall Cutting Knife is suitable when making standard straight cuts along a few pieces of drywall panels. If you are looking to accomplish some drywall repair tasks where you want to replace a section of your wall, all you need is the cutting knife and drywall panels. 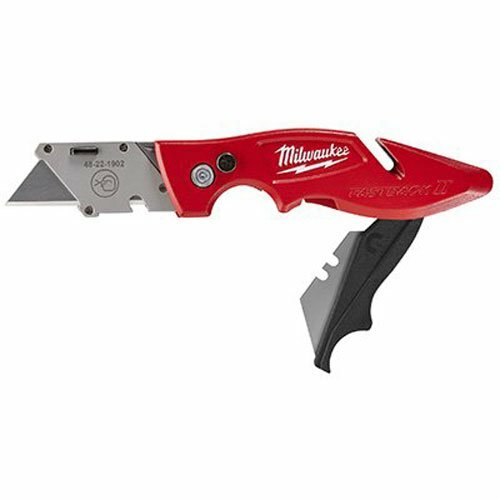 The FASTBACK II Flip Utility Knife features press-and-flip operation that offers for an easy opening. The knife comes with a spare blade that is safely and conveniently stored on a magnetic arm that folds inside its body. Changing the knife’s blade is easy, with its tool-free blade changing mechanism. It is lightweight and ergonomic in design not to mention the strong blades for easy drywall scoring. Start by taking time to measure and mark the cutting lines on the drywall panels. It will help you cut them accurately to length, thus avoiding misfits. I recommend that you use full sheets whenever possible. Wear hand gloves for protection against injuries when using the knife. Place the measured panel on a workbench or flat surface and use the drywall cutting knife to score along the marked lines. Snap the back of the panel along the scored line to cut the drywall. Use the cutting knife to cut the back side of the drywall. TIP: You might want to sand off the edges of the piece to get a smooth fit for the intended area. The Jab saw looks like a large knife with teeth. They are mainly designed for drywall cutting, hence the name Drywall Cutting Saw. These saws are generally affordable and ideal for cutting drywall where precision is not the main factor. Jab saws are also known as drywall keyhole saw, alligator saw, or pad saw. Drywall cutting saws come in two styles, rubber handles, and wooden handles. Rubber handles are light and durable compared to the wooden handles. The wooden handles varieties are a little bit longer. If you are looking for drywall cutting tools for electric outlets in remote areas, then a jab saw should be your go-to tool. Jab saws are suitable for drywall cutting projects where precision isn’t needed. If you are remodeling your remote workshop and you want to install water outlets, then a jab saw is handy for the job. It is also the best drywall cutting tool for electric technicians who install sockets in areas with unstable electricity where power tools cannot be used. 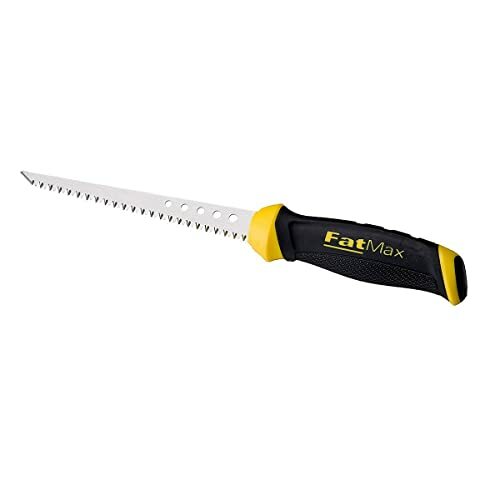 The Stanley 20-556 6-Inch FatMax Jab Saw features a 6-inch cutting blade with SharpTooth technology that is 50% faster than the traditional tooth designs. Its slip-resistant rubber handle offers a comfortable grip making it the best drywall saw on the market. The teeth are induction-hardened, such that they can stay sharp five times longer than the standard drywall saw teeth. Measure and mark the lines that you intend to cut the drywall. Use a drill to make a hole close to the edge of the cutting line. You will use the hole as the starting point when cutting. Hold the saw in such a way that it faces away from your body – just like how you handle the large cooking spoons. Put your thumb on the back of the handle, such that it is parallel with the cutting blade, for a better grip. Start cutting from the small hole and along the edges of the cutting line. Repeat for the other line that is close to the small home. Drill another hole on the other end of the cutting area and repeat the procedure. Finish off the cutting by cutting any remaining pieces within the area. NOTE: Drywall saws are also reliable alternatives when cutting fresh pieces of drywall panels. TIP: If you are wondering on how to cut a hole in drywall with the jab saw in areas where you can’t access a drill, use a chisel and hummer to make the starting point hole. Drywall Cut-Out tools are a unique category of rotary tools that feature adjustable depth guides. They come with powerful motors and a single speed, unlike the typical rotary tools. Due to their larger motors, drywall cutout tools are heavier and bigger in size. When working on your drywall, you will need to use both hands to hold the tool. Some users, especially amateurs, may experience difficulties when controlling cut-out rotary tools. Cut-Out tools have been specifically designed for cutting precise holes on drywall. When equipped with the circular cutter attachment, they can be used when making ventilation and water outlet holes. Hence, it suits professional electricians, DIYers, and drywall contractors. The DEWALT DW660 Cut-Out rotary tool comes with an electric cord and a powerful 5 Amp motor. The tool offers a cutting speed of 30,000 RPM. Despite the large motor, I find it ergonomic and lightweight in design. It is the best tool to cut drywall for anyone who would want to make precise holes and cuts. Just like any other cut-out tool, the DEWALT cutout tool comes with an adjustable depth guide. You will get 1 drywall cutting bit and 2 (1/4”, 1/8”) collets. NOTE: Since cut-out rotary tools are designed for cutting small holes in drywall, you will most likely use it to cut in your existing walls. However, you can still use them to cut fresh pieces of drywall for remodeling tasks. Start by preparing the area that you intend to cut. Observe the depth of the cutting and whether there are electric wires passing behind that part of the wall. Use a ruler and pencil to measure and mark the precise lines that you will be cutting. In case of a circle, you want to mark the pivot point and use the circle cutter attachment. Wear protective gear. I recommend that you put on eye protection gear or sunglasses. Fix the right drywall cutting bit on your cut-out rotary tool. Adjust the depth guide such that you will only go as deep as the depth you intend to cut. In case of a circle, adjust the circular cutter to suit the circumference of your intended cutting. In case of a corded tool, plug in the power cord to the main supply socket. You may test whether the tool is working by powering it on then off. Hold the tool with both hands and point the cutting bit at the center of the cutting area that you had marked. Most people have been asking me how to cut a circle in drywall. All you need is the diameter of the circle and then place the pivot of the cutter attachment on the pivot mark that you had made when measuring. Power on your rotary tool and slowly make the cutting from the center of the area towards one end of the area and then proceed along the marked cutting lines. Continue cutting until you are done with the marked area. Done! TIP: The best way to cut drywall when doing a lot of cutting is by taking a few breaks to clean the dust. It helps in ensuring your cutting line remains visible. NOTE: Always remember to switch off the tool, when it’s not in use. I have experienced quite a number of people who confuse Oscillating Multi Tools for Rotary Tools. 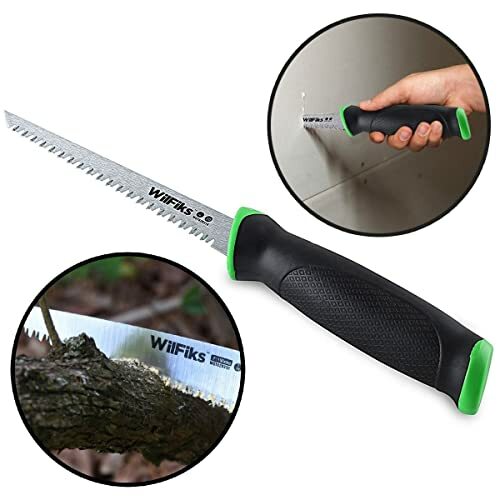 Whereas both are hand-held power tools, latter rotate accessories, while the Oscillating Multi-Tools move accessories in a rapid back-and-forth motion. Oscillating tools are also more efficient and quicker than rotary tools when handling larger tasks. Just like rotary cutting tools, oscillating tools come either corded or cordless. The corded varieties are more powerful and suitable for detailed drywall cutting exercises. Since most of them feature LED light, you will find them convenient when working in darker areas. 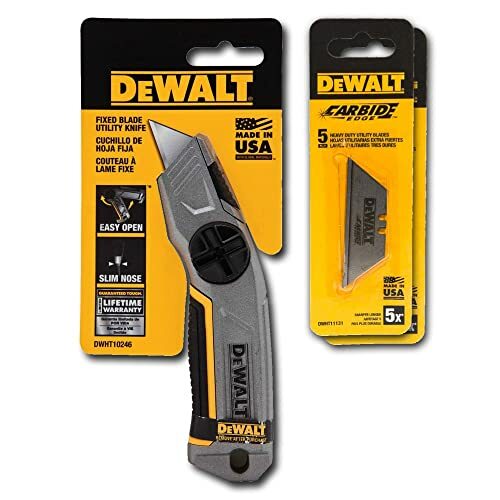 Oscillating Multi-Tools are suitable for cutting large sections of drywall during a repair or patching exercise. In home remodeling, these tools can also be used to cut socket and ventilation outlets on drywall just like the rotary tools. If you are unable to access drywall cutting saws, you can rely on the oscillating tools when cutting a few drywall panels, unlike rotary tools. 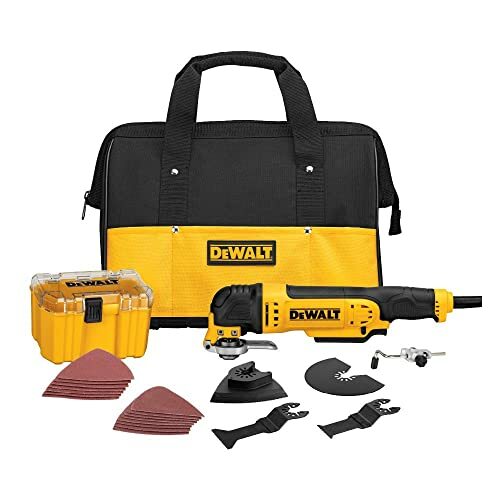 DEWALT DWE315K Corded Oscillating Tool Kit is undoubtedly one of the best power tools for drywall cutting. It features a powerful 3.0-amp motor that offers a strong performance when cutting. I would recommend this tool for the occasional home builders or electric technicians who are wondering how to cut ceiling drywall with minimal damages. Start by measuring the area that you intend to cut with the help of a ruler. Mark the cutting lines with a pencil. In case you are cutting pieces of drywall panels, place the large panel on a working bench or flat surface when measuring and cutting. Fix the drywall cutting blade on the tool. Wear eye and ear protection gear. You can use your sunglasses and headphones if you are unable to get the right gears. You may also want to put on some gloves. Plug your tool into the main supply socket (in case of corded options). For the cordless options, ensure that your tool if fully charged. Power on the tool and start cutting along the marked lines slowly and precisely. Continue cutting along the marked lines until you are done with the area of cutting. TIP: You will need to take regular breaks in order to clean the dust for a better visibility of the marked lines. Most people normally refer them as Dremel. Well, the brand has some great rotary tools, however, there are other brands with such powerful, durable power tools. Rotary Tools feature powerful electric motors and adjustable speeds that range from 5,000 to 35,000 RPM. With the right cutting bits, rotary tools can be used just like the cut-out rotary tools when cutting drywall. Since they are smaller in size, they offer better grips that translate into better cuts even for the starters. All you need is the tool and a drywall cutting bit. For some brands, you may be forced to purchase the drywall cutting bits separately. Rotary cutting tools are suitable for cutting outlets on drywall or when cutting a few pieces of drywall for a home repair exercise. 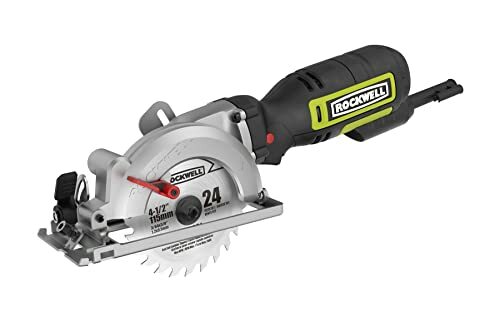 If you are a DIYer or hobbyist home builder looking for a tool to cut drywall for electric sockets or ventilation holes, then this is the right tool. However, if you are a contractor, you may want to invest in a more powerful tool like the Drywall Cut-Out Rotary Tools. 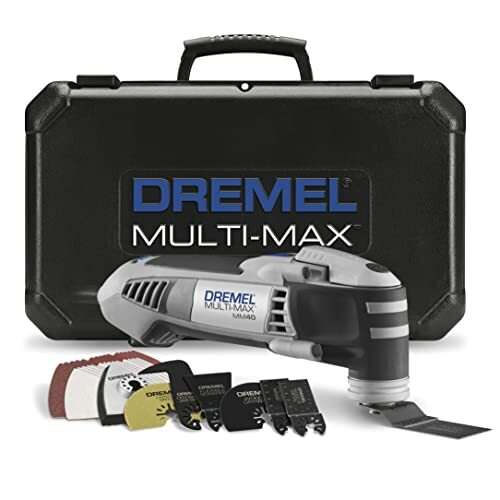 The Dremel 4000-2/30 Rotary Tool Kit is one of the most powerful and most versatile rotary tools on the market today. 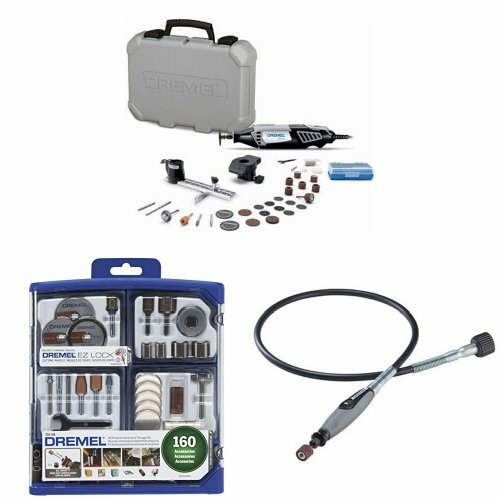 The Dremel drywall cutting tool comes with 160 accessories and a flex shaft attachment. 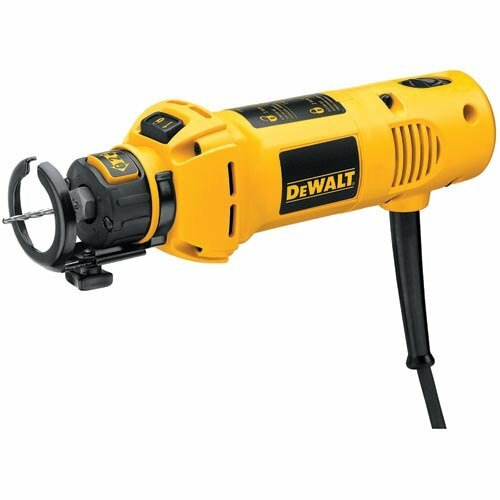 The fact that it is corded with an adjustable speed of up to 35,000 RPM makes it a powerful cutting tool for drywallers, DIYers, home builders. NOTE: Always cut-off power supply to the socket areas that you intend to cut with power tools. Measure and mark the area that you intend to cut with the help of a ruler and pencil. Ensure that you are as precise as possible. Wear eye protection gear – sunglasses will suffice the need. Depending on your tool, you may need ear protection gears. Fix the drywall cutting bit and the adjustable cutting guide. Adjust the cutting guide to match the depth of your drywall. Plug in your rotary tool to the mains electric socket or your power supply – for the case of corded tools. Ensure that the cord is flexible enough to reach to your cutting points. Point the cutting bit at the center of your cutting area and power on the tool. Start cutting from the center towards the edge of one line and then proceed to cut along the line. Continue your cut in a counter-clockwise motion along the edges of the marked cutting lines. Finishing by fixing your intended fixtures with the help of drywall finishing tools and seals with the joint compound. Among the tools that you will need include a taping knife, joint tape, drywall screws, screwdrivers, trowel, and fasteners. NOTE: Most people have been asking me on how to cut drywall on an existing wall. Rotary cut-out tools offer the best way to cut drywall on walls with fixtures that are within the range of cutting. Reciprocating saws are machine-powered demolition tools by nature. They achieve the cutting action through a push-and-pull of the blade in a reciprocating motion. Whereas the tool has been specifically designed for demolition and construction work, it can still serve as a drywall cutting saw. Reciprocating saws feature an electric motor and variable speed setting for controlled cutting. Other saws have been designed with an orbital action that allows for a more aggressive cutting. If you are looking for a compact electric drywall saw, the Recip saws should be your go-to tools. You may need to buy a special drywall blade separately. Reciprocating saws are ideal when cutting a large number of drywall panels. If you are a professional drywaller who installs drywall for a living, you need to consider this tool owing to its versatility. Since others feature variable blade positions, you are assured of not damaging plumbing, electrical works, and telecommunication within the walls. 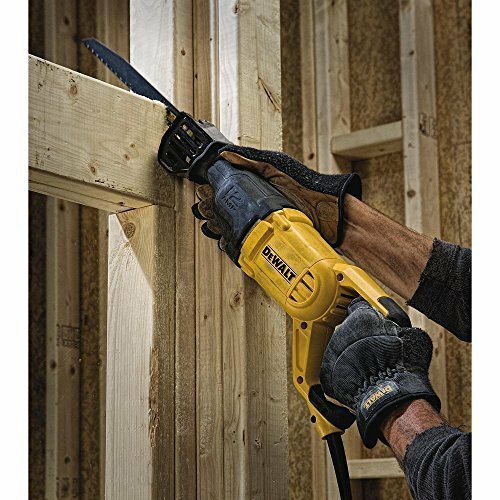 DEWALT DWE305 12 Amp Corded Reciprocating Saw features a 12-amp powerful motor that offers a cutting speed of 0 – 2,900 strokes per minute with a stroke length of 1-1/8″. Its variable speed trigger lets you control the speed when cutting drywall. I found the 4-position blade clamp a nice design for flush cutting in areas where the drywall has been fixed close to other fixtures. Start by measuring and marking the area that you intend to cut. Fix the saw blade on your tool and plug it into the electric socket. Hold the Recip Saw with both hands. Your left hand on the trigger handle and the right hand at the grip that is just a few inches from the blade. NOTE: Your right hand with control the cutting as the left operates the saw. Power on the tool and make a plunge cut on one end of the cutting line. Slowly move along the cutting line as you control the speed of the tool with the trigger. TIP: Just cut as far as the depth of the drywall to avoid cutting into other fixtures. I believe the Reciprocating Saw is the best power tool to cut drywall where accuracy isn’t a factor to consider. Circular saws are powered saws that feature toothed blade or abrasive discs. The blade or discs are spanned around an arbor in a rotary motion hence offering a cutting power. These saws come in different shapes, sizes, and designs. The most conventional ones are hand-held electric-powered circular saws. They are the best saw for cutting drywall panels in large numbers. Unless you don’t have any other tool for cutting into existing drywall, I would advise against using circular saws. However, they are the best cutting tools when cutting a large number of drywall panels during a home building exercise. The tool suits profession drywallers and contractors. 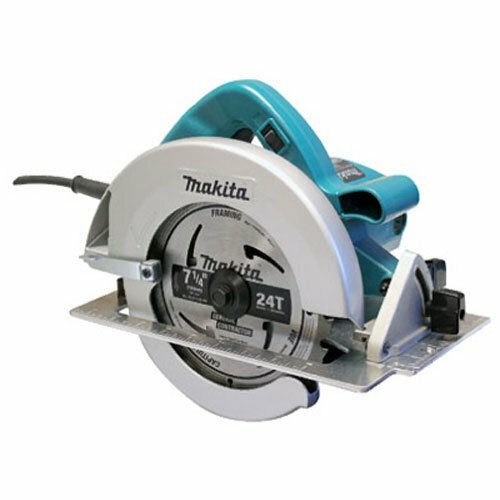 The Makita 5007F 7-1/4-Inch Circular Saw feature a powerful 15.0-amp motor that offers 5,800 RPM. The saw is built in a superior design for easy performance and handling. Among its notable features are the inbuilt dust blower, heavy gauge aluminum wraparound base, AC/DC Switch, inbuilt LED lights for darker areas, and lower guard design for better performance when making narrow and bevel cuts. With the 40-tooth carbide-tipped blade of 7-1/4”, it comes ready for cutting drywalls at depths of 2-3/8″ at 90 degrees and 1-3/4″ at 45 degrees. Start by measuring and marking the areas that you intend to cut. NOTE: Since there will be a production of a high amount of dust, you should mark with a very legible pencil or marker. Fix the cutting blade and adjust the guide depending on the depth of your drywall. Wear your eye and ear protection gear. Sunglasses and headphones may suffice the need! Power on the saw and start cutting from one end of the cutting line. Start slowly and precisely, while watching the actual blade and line when cutting. You should pause along the way to clear the dust when the marked lines get covered. TIP: Some circular saws come with inbuilt dust blowers. You may want to check this feature when purchasing or just look for the ideal circular saw to cut drywall. The Hole Saw Cutter, also known as Circular Hole Cutter attachment, is very reliable when cutting circular holes on drywall. They come in two designs: adjustable drywall hole cutter and cylindrical hole saw cutter. The latter is ring-shaped with a cylindrical cutting blade and serrated saw teeth that have been mounted on an arbor. Hole saw cutters attach to a power drill via the arbor. When rotated at high speeds, they cut holes into drywall and other materials like wood, plaster, and plastic. 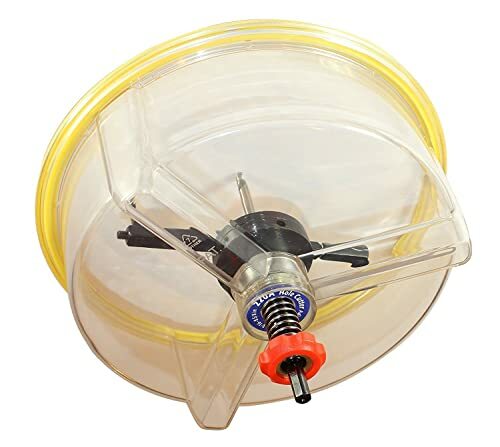 Since most people have drills in their toolboxes, all you need is to get the saw cutter and you will be making precise circular holes on drywall with much ease. The dust shield helps you avoid making a messier workplace. At times, the slug pieces might get stuck in the hole saw. The Hole Saw Cutter is ideal for DIYers or electricians who want to cut holes in ceiling and drywall. Such holes can be used to install speakers, wiring cables, and lighting fixtures. Contractors, plumbers, and remodelers can use them when cutting holes on drywall to install drainage pipes and ventilation fittings. The EZ HOLE Professional Hole Saw Cutter comes as a kit that includes an all-steel hole cutter, a special dust shield, extra blade, storage case, and adjustment wrenches. With it, you will manage to cut accurate holes of different sizes in drywall or plaster ceiling. The specially designed dust shield ensures that the entire exercise is dust free, while the adjustable saw helps you cut holes that range from 1-3/16” to 8-5/8″ in diameter. It can also be used to cut holes in plywood making it a worthy investment for electricians and contractors. 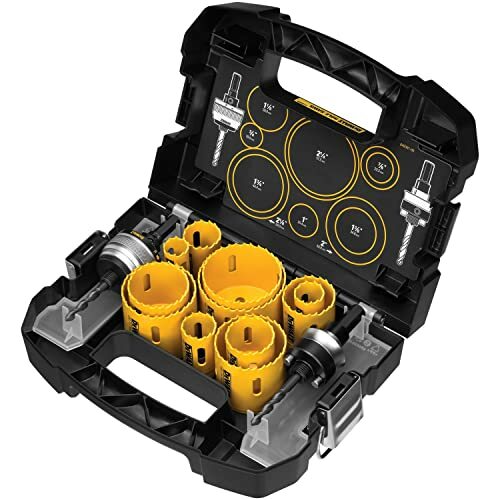 DEWALT D180005 is a Master Hole Saw Kit features 11 holes saws of varied sizes, 2 quick-change mandrels (small and large), a sturdy storage case, and replacement parts. The hole saws have been designed in a deep-cut style for convenient cutting into drywall, plaster, and wood. Owing to its affordability and double tooth-design for an enhanced durability, it is the ideal kit for DIYers and remodelers. Start by determining the size of the hole that you intend to cut by measuring the diameter of the fixture you intend to install. Retrieve your cutter from the case and set the measurements (from the diameter you got in step one). After setting the measurements, use a wrench to tighten the screw in place. Fix the dust shield on the cutter and use a wrench to tighten the nut securely. Insert the cutter into the drill, just like how you would insert a drilling bit. Make a starting point with a pencil at the center of where you would like to cut on drywall. Place the hole cutter drill bit on the starter point and power on the drill. The dust shield will collect all the dust, while the piece of drywall slug will stick on the hole cutter drill. TIP: You can start by making a “pilot hole” with the drill. It will keep the saw bit aligned and secure, making the whole exercise accurate. Fix the right hole saw cutter on the quick-change mandrel. NOTE: In this case, “right” means the saw with the approximate or matching diameter of the circle that you would like to cut. Insert the other end of the hole saw cutter mandrel into the drill. Use a pencil to mark the start point (center) of the hole that you would like to cut. Place the hole saw cutter drill bit on the starter point and power on the drill. You now have an accurate circular hole to install recessed lights, speakers, or other interior design fixtures and fittings. TIP: In case the slug drywall piece gets stuck in the hole saw, you can use a flat head screwdriver to take it out. Drywall cutting tools come in different shapes, sizes, and designs. Some of these tools are versatile, whereby drywall cutting is just one of their many applications. Power tools operate with the help of a power source. Most power tools feature an electric motor that is either powered by a battery or electricity from the mains supply. Such tools allow the user to control the cutting, hence ending up with accurate cuts. These tools don’t need power supply when operating. They include scoring knives and saws. Scoring knives are small cutting tools that are used to score a line on drywalls before breaking them. They are ideal for remote areas where electricity is unstable or unavailable. Well, most of the tools in this guide are hand tools. They feature a compact design that allows the user to hold them in the hand when working. Such tools offer for precise and accurate cutting. Choosing the best tool to cut drywall means that you will avoid damaging the fixtures that are within the cutting range. Moreover, you will also end up with precise cutting, hence making the entire exercise easy and accurate. With the above tools, all you need is finding the right fit and practice using it before working on your precious walls.